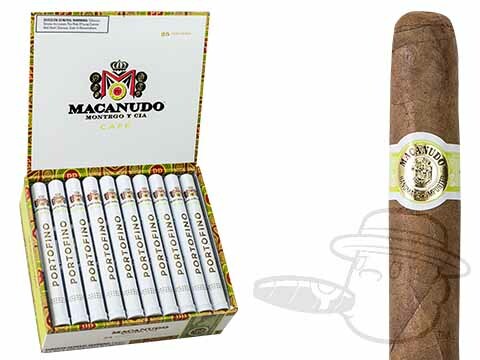 Macanudo Cafe cigars are handcrafted in the Dominican Republic using the finest Connecticut Shade wrappers, a flavorful blend of Dominican tobaccos, and a select binder grown in the rich St. Andres Tuxtla Valley of Mexico. Mellow in smooth character and unmatched in consistency, the masterfully mellow Macanudo Cafe has been satisfying savvy smokers since 1971. Macanudo Portofino Cafe delivers smooth, mellow, and classic flavor in a 7x34 Lancero vitola. Mild but not bland, good daily smoke. Tend to be tight on the draw out of the box, but a week in the humidor (out of the tube) does wonders with this cigar. Best cigar I have found. It fits what I like in a cigar. I love the flavor. I like the size. The only knock is some are a little hard to draw. Fast delivery and cigars are very fresh. My husband loves these cigars and we can't beat these prices and ssuper fast shipping! Smoking a Portofino is more than just smoking a fine, mild-tasting cigar. It is an experience. An announcement that you have arrived, that you are enjoying the good life. A Portofino is not meant to be smoke in a hurry. It takes time to enjoy such a well made cigar. It is particularly satisfying if enjoyed in conjuction with a drink of fine whiskey. In short, a great cigar at a reasonable price. My very favorite smoke. As anticipated, traditional mild and flavorful. Macanudo Portofino Cafe is rated 4.5 out of 5 based on 12 customer ratings.